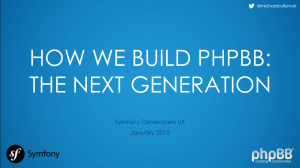 At a recent meeting of the Symfony Developers UK user group in London I gave a talk titled “How we Build phpBB: The Next Generation”. After a brief introduction to phpBB’s functionality the talk covers different aspects of phpBB’s development. It provides insight into phpBB’s history, in particular that of its versioning, and how this affects how we operate to this day – keep in mind that we published our new release policy after this talk was presented. The talk follows the process a feature goes through from a phpBB user’s idea all the way to making it into a phpBB release. Along the way it covers the numerous different tools used to aid us in developing phpBB; such as the issue tracker, GitHub, Bamboo, Travis CI. These tools are vital in helping our quality assurance process preventing regressions and they make it easier to develop phpBB. 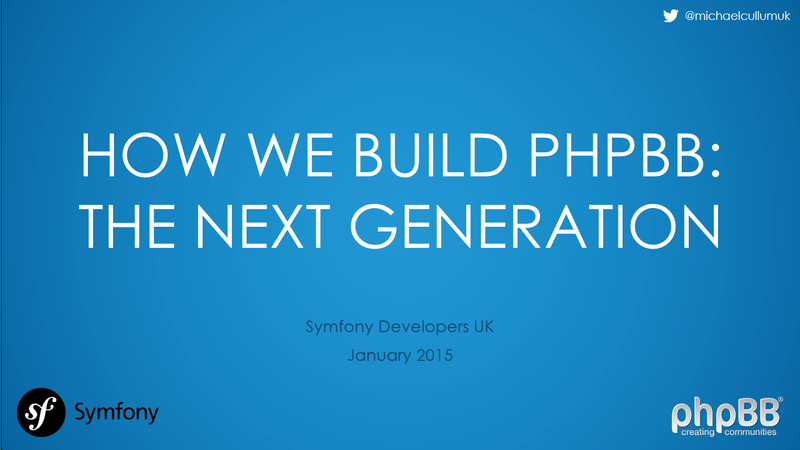 The talk concludes with a summary of the Symfony components we have adopted in phpBB and how we use them. It further explains why we are using more external libraries and components instead of “reinventing the wheel” as the term goes. The talk was well received by the audience and many members of the Symfony community were positively surprised by the amount of Symfony components we now use in phpBB, by the free code and security audits performed by the styles and extensions teams on submitted customisations in order to ensure a high level of quality, and the outstanding security record that phpBB 3.x has now gained. A video of the full talk can be found on Youtube and the slides are available on Speaker Deck. Please note that the slides may not make sense without the context of the talk. If you run a user group or conference and are interested in having this talk, or a similar one, presented at your event by myself or another phpBB team member, please contact me or a member of the management team. The Extensions Development Team would like to ask you (again) to vote for another official extension! Vote Now to be heard (until May 19)!